Aquaback’s technology is ideal for addressing any wastewater treatment problems. Unlike biologically based alternative septic systems, Aquaback solves the problem using physical processes to treat 99% of the wastewater. This ensures reliable, safe, consistent, and effective sewage treatment. All water leaving the DRM has been distilled to the highest quality, and is available for reuse or safe disposal to the environment. Any contaminants in the water exit the system as a dry sterile, environmentally friendly powder. Where environmental nitrogen loading due to wastewater is a problem, Aquaback’s two alternative septic system designs are the only cost competitive solutions that reliably reduce nitrogen discharge to less than five parts per million—a level similar to advanced centralized systems. Both systems are less expensive than building new sewers, especially when individual homes are more than 100 feet apart and also less expensive than worse performing alternative septic systems which do not remove as much nitrogen from sensitive areas. 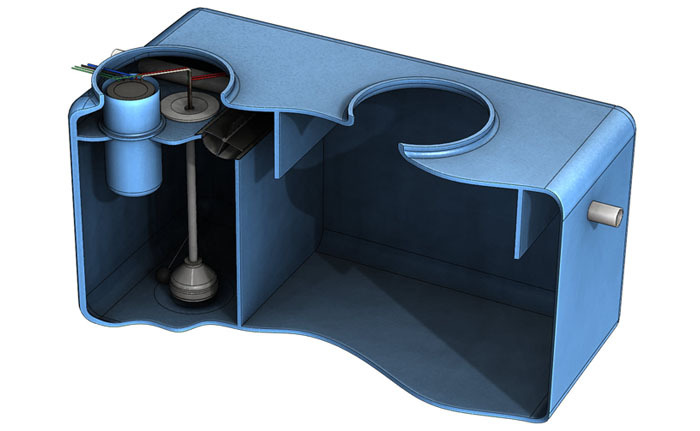 The design depicted, above, uses a DRM to distill existing septic tank effluent which contains concentrated ammonia of up to 80 parts per million. Aquaback is able to remove this amount using a proprietary aeration design. This approach is probably most appropriate for existing homes having working septic systems that are introducing too much nitrogen into a nitrogen sensitive environment. Tank effluent, purified by Aquaback’s DRM meets all local, state, and federal standards and can be safely released to the environment through the leech field or another system. Where employed, the Aquaback Retrofit Alternative Septic System can virtually eliminate the need for septic systems to be pumped out. We are currently taking no obligation pre-orders for the DRM Retrofit Alternative Septic system. If you’re interested in reserving your system, please Contact Us now. The Aquaback Waste Water Treatment System ("WWTS") allows for the decentralized and cost effective disposal of waste. 100% of incoming waste water, typically containing 20 to 30 parts per million of ammonia, is immediately distilled for any desired reuse, including drinking. Our systems will virtually eliminate pollution where employed, obviate the need for expensive, disruptive waste water (sewer) pipes and treatment plants, and reduce water losses from leaks. 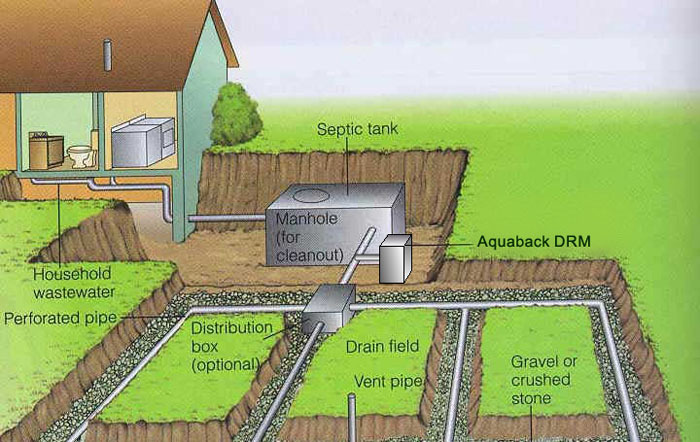 The Aquaback WWTS solution (depicted above) is sized as an alternative septic system to serve single family homes or other small buildings not connected by sewers to a centralized water treatment plant. The same principles used to solve issues related to household wastewater disposal also applied to Larger Buildings, and Cluster Septic solutions. In larger installations, cogeneration and advanced heat recovery will be incorporated into designs. The following flow charts illustrate the differences in load placed on septic systems between the existing solution and Aquaback's WWTS solution. Values represent the percentage of water taking each route. We are currently taking no obligation pre-orders for the Aquaback WWTS. If you’re interested in reserving your system, please Contact Us now.